DMG Audio's innovative plug‑ins combine friendly interfaces with an amazingly comprehensive feature set. 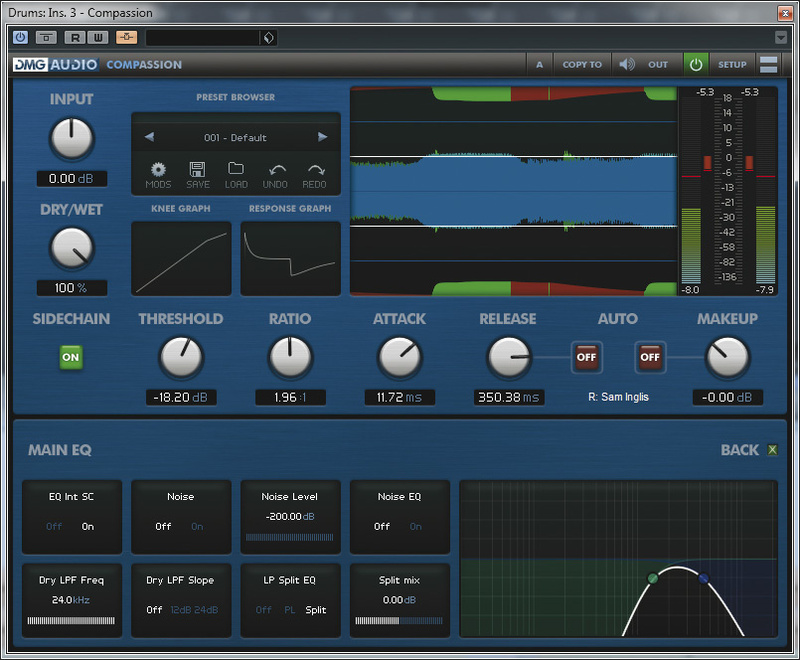 Could they be the only EQ and compressor you'll ever need? Dave Gamble's CV reads like a Who's Who of digital audio. His code has powered plug‑ins from the likes of Focusrite and Sonalksis, but for his latest plug‑ins, he's chosen to go it alone. EQuality and Compassion are, respectively, an equaliser and compressor, and are available in all the major plug‑in formats on Mac and PC. 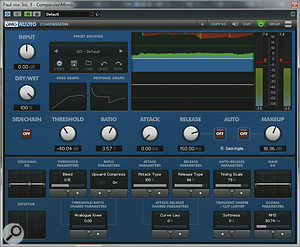 This includes VST3, which means that external side‑chaining is supported in Compassion. Dave's goal in developing EQuality has been to create "a great replacement for all your EQs”. In other words, it's designed to be of sufficiently high quality to be used as a master or bus EQ, yet with a low enough CPU load that you could also use it on every channel of a mix. A lofty goal, indeed! Certainly, no‑one is likely to find EQuality lacking in the flexibility department. To its four fully parametric EQ bands are added low and high shelving equalisers (which can be switched to bell mode), plus one low-pass and two(!) high‑pass filters. The entire plug‑in can be run in one of five processing modes: the standard Digital, the superior Digital+, plus Minimum Phase, Analogue Phase and Linear Phase. Both conventional stereo and M/S operation are supported, and there are some unique bells and whistles too. The resonant frequency of the shelving equalisers can be separated from the turnover frequency, so that at high Q values you can position the resonant peak exactly as you want it. You can also freely adjust the amount of interaction between gain and Q values, to mimic the behaviour of some analogue designs whereby the bandwidth gets sharper as more boost or attentuation is applied. The attention to detail extends to the user interface, which boasts a number of clever features. As expected, you can drag the EQ points around with the mouse, and you can also Ctrl‑click and Shift‑click to bypass them and adjust their bandwidth respectively. Metering is also informative and highly configurable. EQuality's metering is highly configurable.Less usually, there's a Range slider that lets you scale the response of every band simultaneously, so you can retain the overall 'shape' of your EQ curve while experimenting to decide how drastic you want it to be. Another neat touch, which I've not seen before in an EQ plug‑in, is the horizontal frequency-shift slider, which allows an existing curve to be moved up or down the frequency spectrum. The curve itself is drawn very clearly, and you can switch in a detailed spectrum analyser if you want to see the effects of your work in real time. Alternatively, if you prefer not to be distracted by visuals and instead concentrate on how it sounds, you can switch off the graphical display entirely and just use the rotary controls. My first-choice EQ plug‑in of late has been FabFilter's Pro‑Q, and in use, EQuality struck me as having a lot in common with that excellent equaliser. In both cases, much thought has gone into designing an interface that works well in a DAW environment, rather than mimicking some classic piece of analogue hardware; and in both cases, the results are a resounding success, although I don't think that EQuality's GUI quite approaches the slickness of FabFilter's offering. Here, all the EQ bands and their associated controls are always visible, which makes things a little busy by comparison, and because their respective colours don't quite match, I sometimes found myself losing track of which EQ 'blob' corresponded to which set of controls. Nevertheless, it's still a joy to use for the most part, and the Scale and Range sliders are great additions. In sonic terms, meanwhile, I think it also bears out its maker's claims for it. The basic Digital mode is not quite as smooth as Pro‑Q's default mode, but is probably less CPU‑intensive, and definitely a step up from the EQs bundled with most DAWs. However, I found myself using it mainly in the other processing modes. Digital+ seems a little more focused than the basic mode, while Analogue Phase seems somehow 'softer' and kinder to the source material. On the master bus, I thought the extra CPU load of Linear Phase mode was well worth while, bringing a noticeable extra degree of clarity to the proceedings. 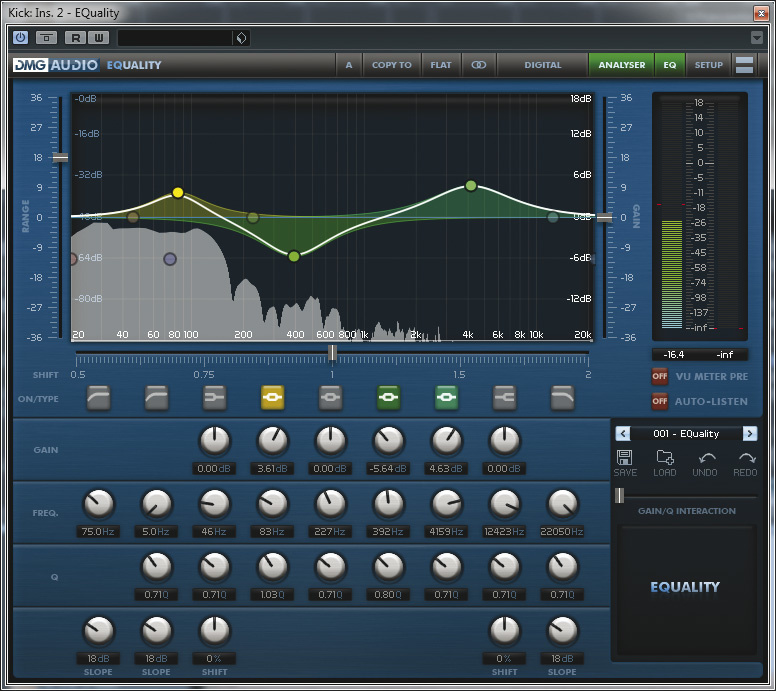 I would certainly be very happy to use EQuality as my only EQ on a mix. EQuality is undoubtedly one of the more comprehensive equaliser plug‑ins around, but Compassion makes it look positively Spartan. Dave Gamble has thrown the kitchen sink at this one, and followed it up with the dishwasher and tumble drier. So bristling is it with features, in fact, that even summarising them would take a lengthy couple of paragraphs. In essence, Dave's aim has been to create a single compression 'engine' so flexible that it can be tweaked to behave like almost any hardware compressor, as well as doing a great deal that no hardware unit can. To take but a small example, many compressor plug‑ins let you adjust the extent to which the left and right side‑chain signals are summed, to control the degree of stereo linking, but Compassion goes several extra miles. To adjust the stereo linking, you move two dots around on an X‑Y graph, which allows you to set a separate L/R sum for each channel of the mix. You could even set one channel's side‑chain to be influenced only by the opposite channel's signal if you wished, an idea that raises particularly interesting possibilities in Mid/Side mode (which is, naturally, supported). 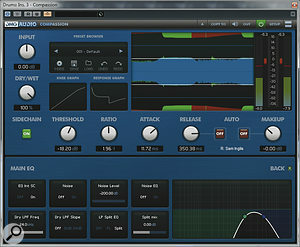 Likewise, side‑chain EQ is a common feature of dynamics plug‑ins, but not as implemented here. To mimic the behaviour of some analogue compressors, you can bleed noise into the side‑chain signal, either pre‑ or post‑EQ; you can also combine internal and external side‑chain signals. On top of that, there's a second pair of high- and low‑pass filters that sits in the signal path itself, and, optionally, the side‑chain path as well. You can even choose to have the compressor act only on the filtered signal, leaving the rest of the audio alone, enabling Compassion to be used as a dynamic equaliser or a sophisticated de‑esser. The attack and release parameters, meanwhile, are almost absurdly configurable. You can specify a 'curve law' that modifies the 'shape' of the response to transients, decouple and reverse the order of the attack and release circuits, and introduce a Hold parameter to delay the onset of the release phase. There's also an adjustable auto‑release algorithm. Should the transients themselves be disobliging enough to escape the attention of the main compressor circuit, you can also engage a fully specified transient shaper and peak limiter, each of which has more parameters of its own than some dedicated plug‑ins do. The behaviour of the threshold and ratio parameters can be tuned in yet more different ways, some tailored towards the possibility of mimicking typical analogue circuits, others offering advanced dynamic control. A variable knee control is joined by a Bleed parameter, which can help create a Dbx‑style 'over easy' effect, plus a Hysteresis parameter that offsets the threshold values for the attack and release circuits. You can specify a Ceiling, or maximum amount of gain reduction, and a Ceiling Curve that governs whether this operates as a 'brick wall' or as a gradual limit. A complementary Depth parameter specifies a maximum amount of gain reduction that will be applied when Compassion is used as a gate or expander. Here, Compassion is serving as a dynamic EQ on a drum bus, side‑chained from the vocal track.By now, I doubt that anyone will be surprised to learn that Compassion can be used as a gate or expander, but, once again, its versatility is impressive. It can, in fact, simultaneously perform conventional expansion or gating, upward expansion (which increases the dynamic range of signals above the threshold) and upward compression (which squashes and makes louder the audio below the threshold, while leaving peaks untouched). The main Ratio control, meanwhile, runs from 1:1 at the leftmost extreme, through infinity:1 (hard limiting) at about two o'clock and then into negative compression, where the gain range of the signal is inverted. This is something I've only seen before on a few compressors, perhaps most famously the Eventide Omnipressor, and although you wouldn't want to use it every day, it can make for some interesting special effects on percussive sources. If there's one thing that's missing, it's the ability to set a different threshold level for the expander from that used by the main compressor. This can be a useful feature where, for example, you want to compress signal peaks while reducing low‑level noise, but leave the central part of the dynamic range alone. Of course, no‑one would want to manually set every single Compassion parameter every time they used it, so as well as supporting conventional preset saving and loading, Compassion also incorporates what DMG call "mods”: the ability to store a chosen subset of parameters. For example, if you've hit upon the perfect combination of behind‑the‑scenes tweakage to recreate an 1176 in every detail, you could store those tweaks as a mod, then simply use the Attack, Release and Threshold controls to set up your virtual vintage compressor for a particular track. If that massive array of subtleties all sounds a bit intimidating — and it certainly did to me — it's a relief to learn, on first loading up the plug‑in, that you don't have to concern yourself with any of it if you don't want to. The basic Compassion screen simply shows the most important, conventional compression controls, along with a very distinctive graphical display. 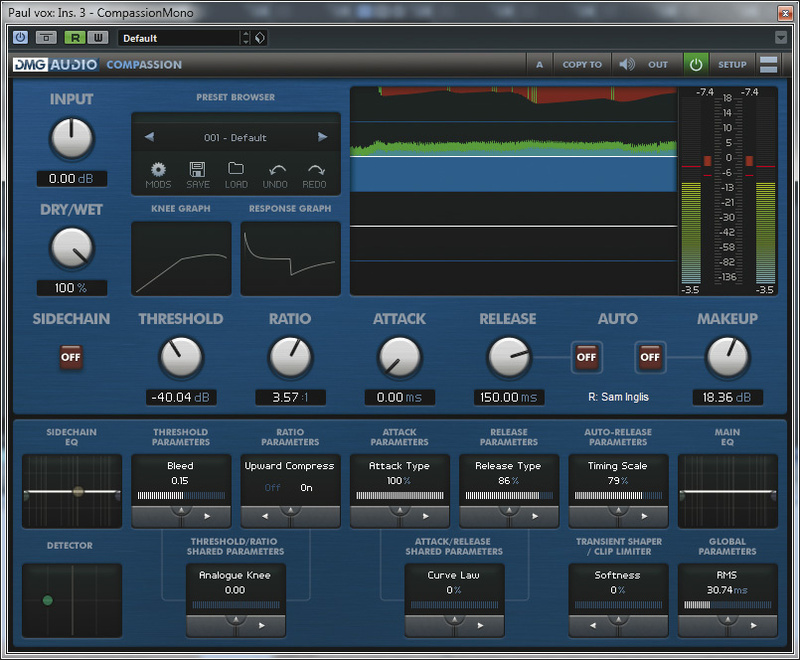 This, again, is slightly reminiscent of the scrolling display in FabFilter's Pro‑C compressor: the input waveform scrolls from right to left, while above and below it the amount of gain reduction is illustrated by the thickness of a coloured band that is alternately green or red, depending on whether the compressor is in its attack or release phase. The threshold level is shown by a white line, and you can choose to view the input or side‑chain waveform superimposed on the output waveform if you wish. It takes a while to learn how to get the best from such a display, and personally, I found I needed to choose a slower 'logging speed' in order to comprehend what was going on. Fortunately, it's joined by a very configurable and much more conventional bar‑graph meter, and you can switch it off if you want. The many extra controls for detailed configuration are accessed in an optional panel below the main window, where they are organised into a number of panes. The sheer flexibility of Compassion also means that it shines in problem‑solving roles where other compressors simply wouldn't work. For example, I was mixing a multitrack recording of a band that I'd made live, where drum spill on the vocal mic was proving a big problem. The drums sounded fine until I faded up the vocal, whereupon they acquired a nasty, trashy ring at 2kHz. I was able to deal with this to some extent by using Compassion as a dynamic equaliser on the drum bus, side‑chained from the vocal track. The vocal was fed into Compassion's side‑chain, where it was filtered; I then set up the main Compassion EQ to isolate the 2kHz region and only compress that. The result was that when automation lifted the vocal fader, and with it the 2kHz drum spill, the same frequency range was compressed on the drum bus itself: the results were far from perfect, but did seem to keep the overall tone of the drums a little more consistent. Although it's very different in look and feel, the philosophy behind Compassion reminds me a little of McDSP's long‑established Compressor Bank plug‑in bundle. That, too, aims to use a single algorithm both to provide versatile dynamic control and to recreate the idiosyncrasies of hardware compressors. Compassion ups the ante even further in the features stakes, however, and is also more widely available than Compressor Bank, which is Mac‑only and doesn't support VST. Quality‑wise, then, I would have no qualms at all about using Compassion as my only compressor, the more so since it can handle gating, expansion, dynamic EQ and transient shaping as well! On my system, however, I found that its impressive feature set brought with it a rather higher CPU load than most generic dynamics plug‑ins, so I gravitated towards using it only in the most important or challenging mix roles. Overall, both EQuality and Compassion are up there with the best plug‑ins of their type I've tried, and as such are priced pretty keenly. If you like the idea of having one EQ or compressor to 'rule them all', rather than a number of different plug‑ins for different purposes, they fit the bill admirably. EQuality is a nice‑sounding and very flexible EQ that can operate in CPU‑light Digital mode and a variety of others, including Linear Phase. Compassion is extraordinarily powerful: quite possibly the most versatile dynamics plug‑in yet created! Compassion's power brings with it a relatively high CPU load. EQuality £99.99; Compassion £149.99. Prices include VAT.